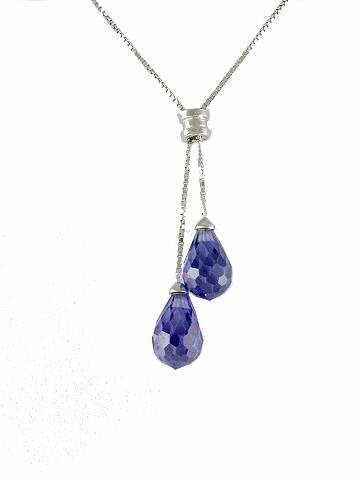 Chic, classic and oh so beautiful, Siberian Tanzanite necklace, featuring two faceted peardrop crystals suspended from a rhodium-plated, 925 sterling silver box chain. The colour of these gems is far, far more vibrant 'in the flesh' - highly recommended. This is a real Tanzanite crystal which is lab-grown. Genuine Tanzanite crystals are collected and then grown in controlled conditions in a laboratory. This process produces completely flawless, pure violet Tanzanite crystals. Despite these crystals being grown in a lab, they still possess the same metaphysical vibrations as natural specimens. ‘Siberian’ in gemology terms, is often applied to gemstones of a flawless nature and of the and highest AAA grade, as with this one; hence the name, 'Siberian Tanzanite'. This beautiful violet-blue stone takes its name from its source; Tanzania in Africa. Due to its increasing scarcity, it is more often found in small jewellery settings, or as found here, as beautiful pure larger lab-grown specimen. Metaphysically, these stones are said to be powerful carriers of the Violet Flame, which is governed by Archangel Zadkiel. Archangel Zadkiel is Master of the 7th Ray - the Violet Flame. The keywords associated with this ray are Freedom, Mercy, Transmutation and Forgiveness - of the self and others. Prolonged use of this stone, whether through regular meditation with a small piece or by wearing the crystal, can clear any blockages which may be present between the 5th, 6th and 7th and higher chakras; thus creating an open channel. It is also said to aid inner vision and psychic abilities. It is best cleansed by moonlight. Tanzanite in its natural form is a violet-blue gemstone variety of Zoisite.